NOSE: This is a fun one to sniff. Sweet, sour and spicy. Sour wine, over-ripe, dark stone fruits, candi sugar, and bursts of cinnamon and licorice. TASTE: Fun to drink too. Big tart, sour burst up front that fades to candy apple and molasses at the finish. Bigger, bolder malt profile than other Flanders Reds. Complex at the start and gets even more so as it warms. Very cool beer. MOUTHFEEL: It’s a full, lush brew, but the powerful carbonation keeps it light on the tongue. DRINKABILITY: Perhaps not as refreshing as something like the purely sour Monk’s Cafe, but this is one of the best Flanders Reds around. A beer to ponder and appreciate as it changes from sip to sip. Wifey McHops loved it. 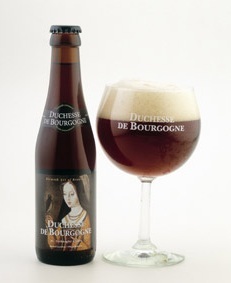 Posted in Tasting Notes.Tagged Duchesse de Bourgogne, Flanders Red, Verhaeghe.